Imagine the scene. A 9.0 earthquake hit Japan’s Fukushima Daiichi nuclear power plant in March 2011 and triggered a tsunami with 46-foot high waves. The seawall was overwhelmed and three of its six nuclear reactors melted down due to the loss of electrical power from the flooding, resulting in the largest nuclear incident since Chernobyl. 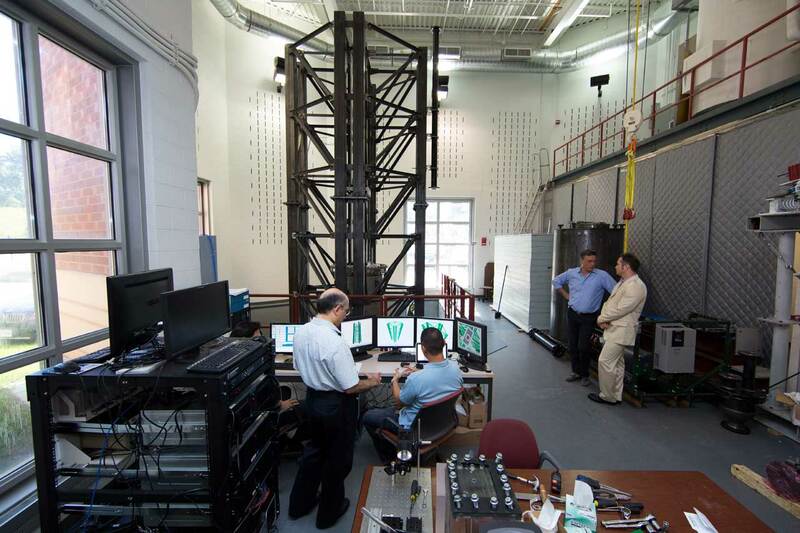 The disaster sparked new interest in the behavior of nuclear reactor cores during earthquakes, leading to an international interdisciplinary research project. 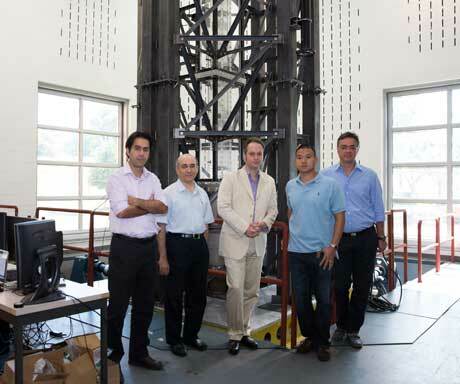 Philippe M. Bardet, assistant professor of mechanical and aerospace engineering and lead researcher on the project, and his colleagues, Elias Balaras, professor of mechanical and aerospace engineering, and Majid Manzari, professor of civil and environmental engineering, were awarded more than $860,000 in 2012 by the U.S. Department of Energy (DOE). They are working in collaboration with the French Alternative Energies and Atomic Energy Commission. 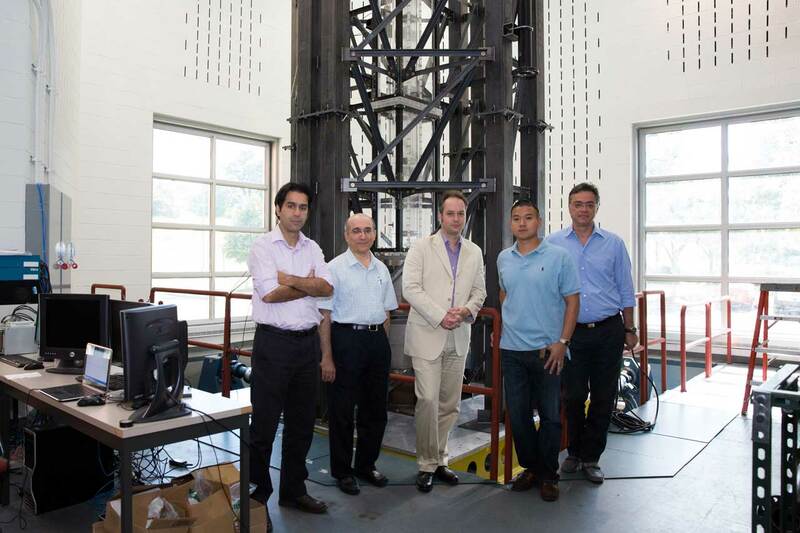 The GW research team, all from the School of Engineering and Applied Sciences (SEAS), includes doctoral students Morteza Rahimi, civil and environmental engineering and Noah Weichselbaum, mechanical and aerospace engineering. 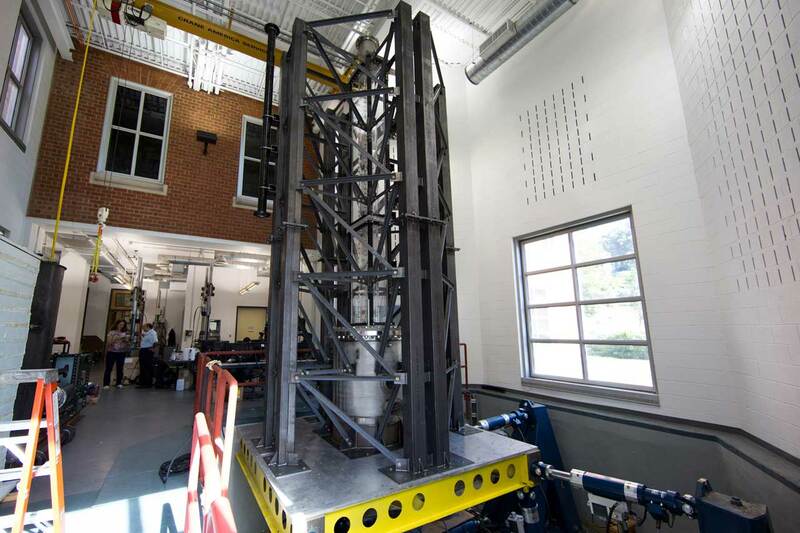 The team built the model for simulating fuel assembly vibrations inside of a nuclear reactor core on the “shake table” located in the Earthquake Engineering and Structures Laboratory at GW’s Virginia Science and Technology Campus in Ashburn, Va. 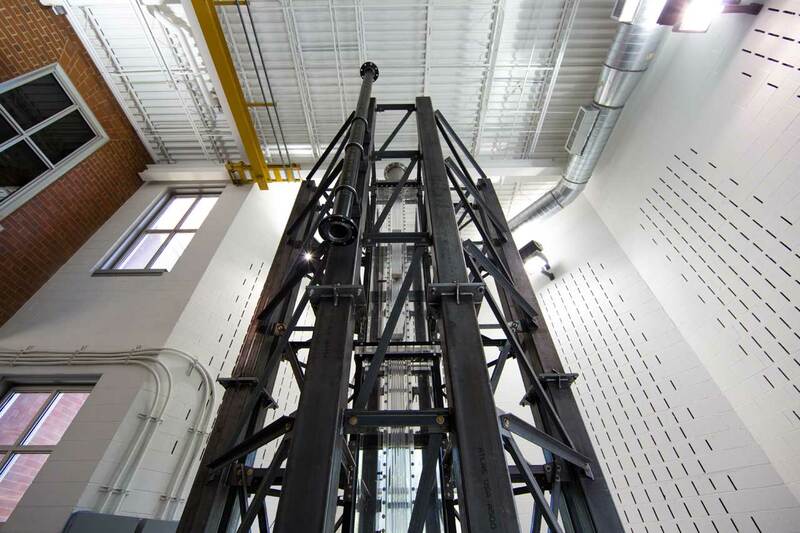 The laboratory features one of the most sophisticated earthquake simulators of its kind in the nation. 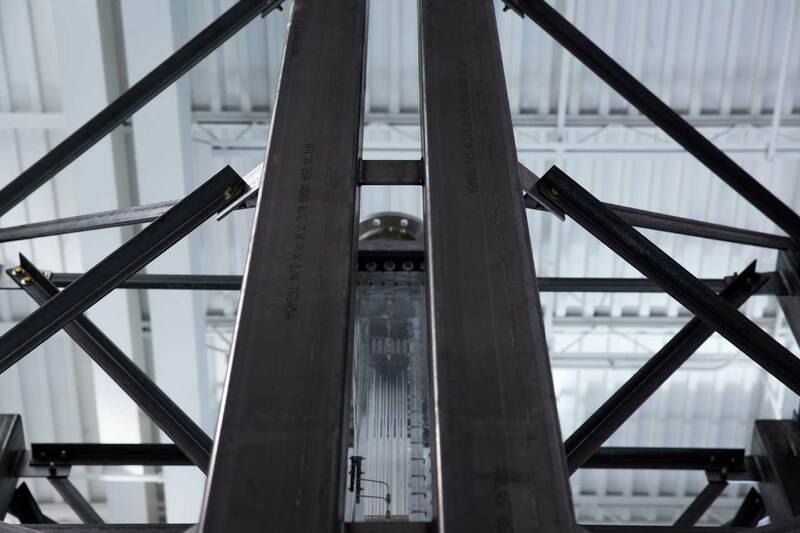 The model consists of a single bundle of simulated fuel rods inside the core of a common type of nuclear reactor, called a pressurized water reactor. The fuel rods generate heat and are cooled down by highly turbulent water flowing vertically around them. The heat is then utilized to generate electricity. 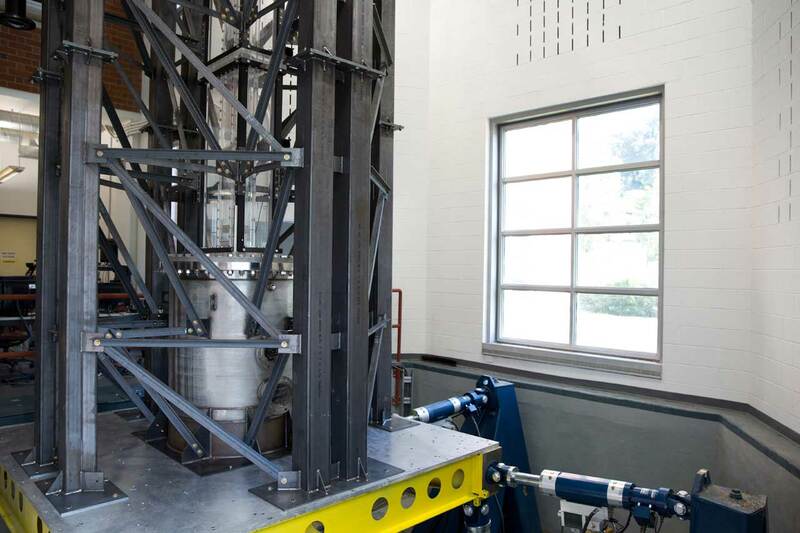 While this small-scale model has only one bundle and a reactor core has nearly 200, the scientific constraints used to run the study are consistent with typical operating conditions. 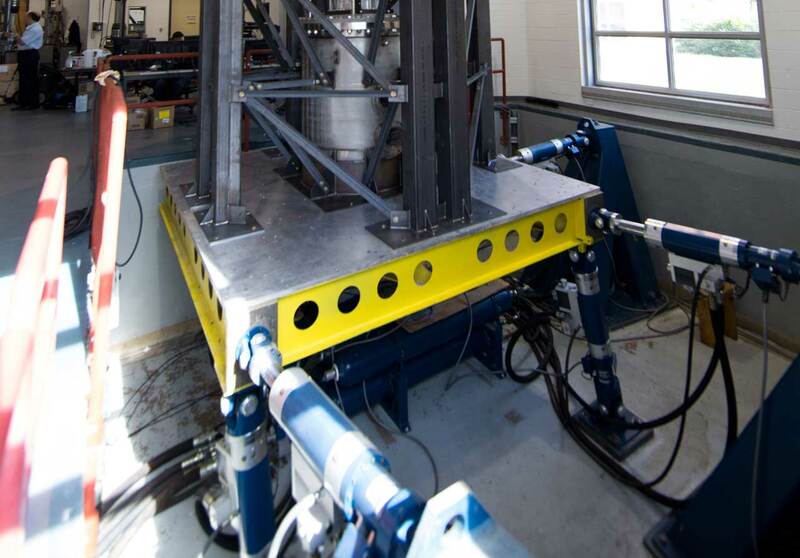 The team will be observing the interaction between the fuel rods and the fluid around it, as different types of earthquakes will be simulated on the shake table. Advanced optical diagnostic tools have been specifically developed to instrument this multi-scale and multi-physics phenomenon. In parallel to the experiments, Prof. Balaras’ group is conducting high-fidelity computer simulations of the same configurations to complement the experimental results and also enlarge the parametric space to different materials and models not accessible by experiments. Due to the complexity of the problem the computations are conducted on the largest supercomputers available today at DOE. A typical computation utilizes the equivalent of 200,000 personal computers for several days to simulate a few seconds of an earthquake and its effects on the fuel rods. The project is approximately two-years into the three-year grant period. 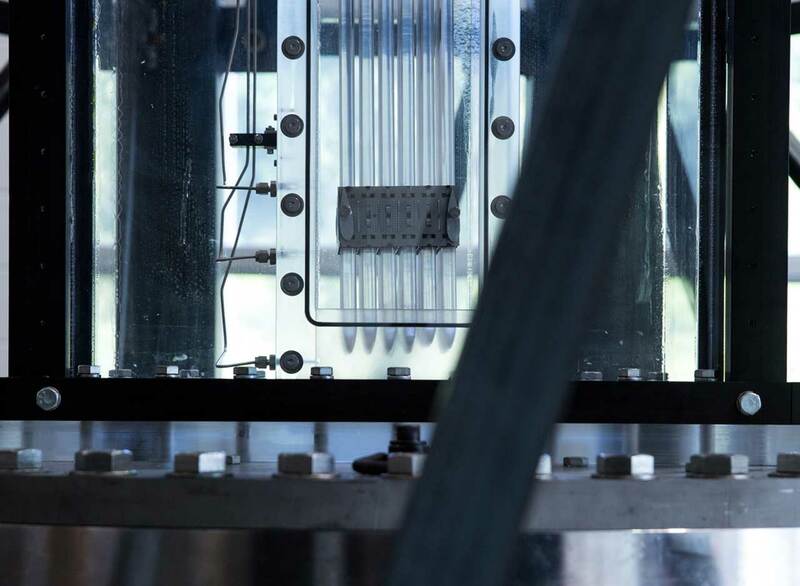 The findings of the research have implications for nuclear fuel design and analysis well into the future.